Shop Online for Your Air-Cooled VW Air Conditioning Unit! 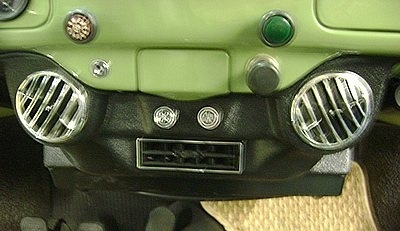 Type 3 A/C Has Arrived for Fastback, Squareback, and Notch! Gilmore Enterprises has been specializing in restoring and building air conditioners for air-cooled Volkswagens for more than 20 years. It is our specialty, and our units work really well. We have air conditioning in many show winning vehicles and daily driver vehicles have been acknowledged by the leading air-cooled VW Magazines as the best A/C system for your air-cooled Volkswagen. Whether you're driving an old VW Beetle, VW Bus (Microbus, Transporter, Kombi, VW Camper, Campmobile), Karmann Ghia, Fastback, Squareback, Notchback, or 912/914, we can provide you an a/c unit that works. We have provided them for not only show cars, but also for many who still drive Volksies as their daily drivers. With new compressor technology, they take almost no power away from the motor, and can deliver really cold air on even the smallest of VW engines-- like the 1200cc. So unfortunately, the original units never worked well and parts are impossible to find, but say that you have an old Beetle that you are restoring, and it was originally equipped with an air conditioning unit from the factory. You want something that looks original-- ours does! No dealing with a unit that doesn't work well, fan problems, and inefficiency-- you get a unit that looks truly similar to the original, and works great! So many air-cooled VW's have been customized over the years. VW chasis were used in kit cars, and as the base for many other venicles. If one of our kits doesn't fit your application, we also offer systems for dual carbs su ch as Weber IDF,IDA,ICT, DCNF or the EMPI copies of the Weber and also Dellorto carbs and Fuel Injection systems. The systems can be built with Single belt driving everything or a dual belt with a separate belt driving the compressor. We can also build it for a Serpentine belt system. Depending on your needs we can usually build you a custom unit to fit your application such as kit cars, or cars with custom dashboards. Just give us a call to discuss your project. Take a look at the kits offered on this site and don't hesitate to Contact Us or check our FAQs if you have additional questions about our kits or future kits under development. Here's a Vid of Our Compressor in Action!